Writing in the August 11, 2014 issue of Developmental Cell, David A. Cheresh, PhD, Distinguished Professor of Pathology and vice-chair for research and development, Jay Desgrosellier, PhD, assistant professor of pathology and colleagues specifically identified a key molecular pathway associated with aggressive breast cancers that is also required for mammary stem cells to promote lactation development during pregnancy. Mammary cells found during pregnancy that express integrin beta3 (CD61) act as stem cells, capable of reconstituting a new mammary gland in mice. This property may be to blame for the more aggressive nature of beta3-expressing breast cancer cells. 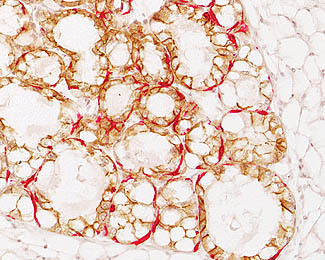 Shown is a section from a mammary “outgrowth” harvested at lactation and immuno-stained for the epithelial markers E-cadherin (brown) and alpha-SMA (red). During pregnancy, a new mammary stem cell population arises, distinct from those involved in development and maintenance of the non-pregnant gland. These stem cells remodel the breasts and lactating glands in preparation for feeding the newborn child. Normally, these stem cells contribute only to early remodeling events and are switched off by the time milk production begins. The researchers found, however, that signals regulating stem cell activation during pregnancy appear to be hijacked by cancer cells to produce faster-growing, more aggressive tumors. “This normal pathway ends up contributing to the progression of cancer,” said Desgrosellier, first author of the study. A connection between pregnancy and breast cancer has long been known. But the association between pregnancy and breast cancer risk is complex. While having a child reduces a woman’s risk of developing breast cancer later in life, there is also an increased short-term risk for the development of a highly aggressive form of breast cancer following each pregnancy. The current study suggests that molecules important for stem cell behavior during pregnancy may contribute to these more aggressive pregnancy-associated breast cancers, a possibility the researchers plan to investigate further. The authors are quick to point out that their findings should not be interpreted as a reason to avoid pregnancy. The signaling pathway usurped by cancer cells is not the cause of breast cancer. Rather, they said, it may worsen or accelerate a cancer caused by other factors, such as an underlying mutation or genetic predisposition. The researchers focused on a family of cell surface receptor proteins called integrins that act as key communications conduits, ultimately zeroing in on the role of one member of this family called beta-3 integrin. Also known as CD61, it was already linked to metastasis and resistance to cancer drugs. Co-authors include Jacqueline Lesperance, Laetitia Seguin, Maricel Gozo, Aleksandra Franovic and Mayra Yebra, Department of Pathology, UCSD Moores Cancer Center; and Shumei Kato and Sanford J. Shattil, Division of Hematology-Oncology, Department of Medicine, UCSD. Funding for this research came, in part, from the National Institutes of Health (grants CA168692, HL57900 and R3750286) and the California Breast Cancer Research Program.